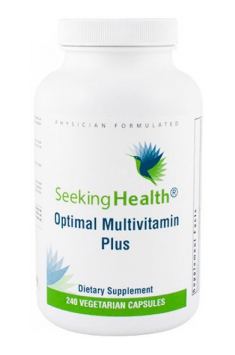 Seeking Health Optimal Multivitamin Plus is a complete multivitamin preparation enriched with essential minerals, crucial nutrients, and unique plant extracts. Its formula is perfectly balanced – the blend includes all the most important nutrients for health, with particular attention attached to their forms and doses, which guarantees the product’s unique efficacy. The supplement exhibits remarkably versatile activity, it enhances the organism’s condition in all aspects, and affects both physical and mental well-being. It is recommended for people who are looking for a universal and complete health-promoting preparation. Vitamin complex provides the organism with all critical vitamins in their biologically active forms. It includes the vitamin essential for normal vision, growth and development, that is vitamin A in the form of beta-carotene and retinol; vitamin C, relevant for immunity; vitamins D3 and K2, cooperating in order to strengthen bones; and a strong antioxidant, that is vitamin E, in the most assimilable and efficient form of tocopherols. The preparation also includes the whole vitamin B complex, which controls metabolism and regulates the functioning of the nervous system. Importantly, the product contains their coenzymatic forms, thanks to which they can be immediately used for whatever the organism needs at the moment and are safe even for people with a mutated gene MTHFR. It is worth mentioning that the manufacturer used benfotiamine in the product, that is an extremely innovative fat-soluble form of vitamin B1, as well as a substance rarely found in multivitamin preparations, that is vitamin B10 (PABA), which delays aging processes and enhances the condition of the skin. Mineral complex provides essential micro- and macroelements, which are responsible for osmotic balance, perform the function of components of teeth, bones, hair and nails, and above all, they are essential participants of many enzymatic reactions. It is crucial that a great majority of the minerals contained in the preparation have the form of stable and the best assimilable chelates, prepared with the use of the patented method TRAACS®. The complex includes: magnesium, which has a beneficial effect on the nervous system, regulates the functioning of the muscular system, prevents cramps, and strengthens bones along with calcium; zinc – essential for immunity and responsible for male fertility; iodine and selenium, which support the health of the thyroid gland; the elements that determine collagen synthesis, that is copper and manganese; potassium, which controls electrolyte balance; the rare element molybdenum, which determines normal protein, fat and carbohydrate metabolism; and chromium, responsible for sugar management. Proprietary Cognition Blend includes extracts of plant classified as adaptogens. Their basic function is strengthening the condition of the nervous system, increasing stress resistance, and bringing out the natural intellectual potential hidden in a person. The adaptogens contained in the preparation have nootropic properties – they enhance memory, facilitate concentration, and increase intellectual performance. It is important that all the extracts are highly standardised, so they provide great amounts of the most important active substances responsible for the therapeutic activity of the plants. This category includes: ashwagandha with its anxiolytic and antidepressant effects; the energy-boosting and memory-improving Siberian ginseng; a Bacopa monnieri extract that stimulates the development of neurons and in that way enhances that functioning of the brain; a ginkgo biloba extract that improves the ability to remember and draw logical conclusions; and gotu kola, which supports creativity and intellectual capacity. Proprietary fruit and vegetable blend combines a garlic extract, which works as a natural antibiotic; unique algae – chlorella and spirulina, which nourish and detoxify the organism; and citrus fibre, essential for normal digestion. Proprietary antioxidant blend provides the organism with valuable antioxidants, which ensure the balance between the processes of oxidation and reduction, sweep excess free radicals from the body, reduce the intensity of inflammations, and prevent oxidative stress. In that way, they enhance the functioning of the cardiovascular system, slow down aging processes, and minimise the risk of developing chronic diseases. The blend contains: coenzyme Q10, which supports the functioning of mitochondria; shilajit, which performs the function of a natural immune system modulator; a French maritime pine bark extract, which inhibits glycation, enhances the condition of blood vessels, and prevents platelet aggregation; and a melon extract, a remarkably powerful stimulator of the activity of the enzyme superoxide dismutase (SOD), that is one of the strongest endogenous antioxidants in the organism. Proprietary liver support blend provides complex protection for hepatocytes and enhances detoxification processes in the organism. Quick and efficient removal of metabolic by-products and health-threatening compounds from the organism is crucial for maintaining the effective functioning and homeostasis of the entire body. The category contains: a milk thistle extract with silymarin, which regenerates damaged liver cells and blocks access for nearly all types of toxic chemical compounds; a turmeric extract with curcumin, which stimulates bile secretion and protects the liver from damage induced by the activity of free radicals; glucoraphanin isolated from broccoli sprouts, which is a precursor of sulphoraphane – a compound that supports liver detoxification and activates the enzymes of detoxification phase 2. Their proper absorption and assimilation is determined by bioperine, that is a standardised black pepper extract. Tests have proven that it increases the absorption and management of curcumin by over 2,000% (!). Proprietary vision support blend provides valuable components that nourish, strengthen, and protect the eyes and are crucial in terms of preventing eye diseases. They include: lutein and zeaxanthin obtained from marigold, that is the most important carotenoids that nourish the fragile structures of the eye, protect them from the harmful effects of blue light and in that way enhance vision; a bilberry extract, which brings relief in the so-called dry eye syndrome; and lycopene, which reduces the risk of macular degeneration and prevents the cataract. Proprietary amino acid blend combines two essential compounds: N-acetyl cysteine (NAC), which increases immunity and is a glutathione precursor; and betaine hydrochloride, which acidifies the stomach and supports digestion, but it also helps to reduce homocysteine levels, that way reducing the risk of developing atherosclerosis. Complementary blend is a proprietary blend of rare minerals, trace elements and nutrients. They are usually omitted in supplementation despite having a very beneficial effect on health and performing specific, remarkably important functions in the organism. The blend contains: two compounds belonging to the B vitamin complex, that is inositol and choline, which nourish brain cells and cooperate in order to enhance cognitive health; boron, relevant for optimal brain activity; and vanadium, which prevents heart diseases. The last one is particularly valued by athletes, as it enhances the transport of nutrients to muscle cells, that way improving the appearance of muscles in the body. The long list of ingredients ends with a common horsetail extract, which provides the organism with valuable silica, a substance that supports hair growth and strengthens the structure of nails. To sum up, Optimal Multivitamin Plus is an extraordinarily rich preparation recommended both for men and for women. It will prove fantastic in the case of weakness, during convalescence or chronic stress, when the organism needs special support in order to function normally. The supplement complements the diet with all deficient components, improves the quality of life, and constitutes a perfect element of preventive healthcare. Optimal Multivitamin Plus 240 caps. Take 8 capsules a day with a meal, in separate doses or as instructed by a healthcare practitioner. Multicomponent preparation recommended as general preventive healthcare. It contains fantastically balanced doses of essential vitamins, minerals, and nutrients. It includes both water- and fat-soluble substances. The recommended dosage is 8 tablets, which should be taken in several separate doses, preferably with a meal. It is advised that supplementation lasts for about 3 months. Glucoraphanin - a compound naturally occurring in broccoli (especially in its sprouts), which is a precursor of the biologically active sulforaphane. The conversion of glucoraphanin to sulforaphane takes place under the influence of the enzyme contained in broccoli tissues and it may also be carried out (although less effectively) by means of probiotic bacteria inhabiting large intestine of a human being. Supplementation with glucoraphanin demonstrates its effectiveness by the stimulation of sulforaphane production. This compound belonging to the group of isothiocyanate demonstrates considerable anticancer properties. On the background of other supplements of this kind, it is distinguished by multidirectional activity. It has inhibiting influence on the development of cancer cells from the moment of their formation, through proliferation, to limiting the risk of metastases. Moreover, sulforaphane is indicated as an effective way to fight with bacteria Helicobacter pylori, responsible for the creation of ulcers in the stomach and duodenum. Some sources suggest that the effectiveness of sulforaphane in this field is so important that it may be effective even in relation to antibiotic-resistant forms of Helicobacter pylori. Sulforaphane also demonstrates antioxidant properties. It may reduce the amount of free radicals in the organism, decreasing oxidative stress. Moreover, it is attributed anti-inflammatory properties. It may also optimize lipid profile by increasing the concentration of lipoprotein HDL and decreasing the level of lipoprotein LDL.